In an attempt to 'secularise' the word 'Ramdhenu', the West Bengal Council for Higher Education has replaced the word with 'Rongdhenu' or bow of colours. 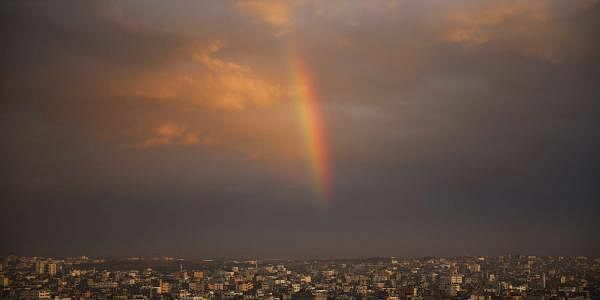 KOLKATA: The traditional name for rainbow in Bengali is 'Ramdhenu' or Lord Ram's bow. However, in an attempt to 'secularise' the word, as opposed to saffronisation attempts in texts books of several BJP-ruled states, the West Bengal Council for Higher Education has replaced the word with 'Rongdhenu' or bow of colours. circles, while some calling it 'language terror' and others saying it is in line with alleged appeasement policies of Mamata Banerjee. replaced with a wrong one in our textbooks as our future will learn wrong or a distorted word due to political fancies. This is nothing but language terror," linguist Rakesh Banerjee said. widely used in Muslim-majority Bangladesh instead of 'Akaashi' that is used in West Bengal. feel there is any further need to import Bangladeshi words in Indian curricula," linguist Sadhan Das said. After the revelations came to fore, social media was flooded with updates by individuals stating that the recent change of word was in line with alleged appeasement policies of Mamata Banerjee. After formation of Pakistan, under directions of the government, a committee headed by Md Sahidullah gave several suggestions of change of 'Hindu-influenced' words in Bengali language of East Pakistan (present-day Bangladesh) with that of more Islamised words that were basically loaned from Farsi.